Hi friends – keeping this real short w/ just a top 30 this week as we are in the midst of our annual funding drive and also running a super big, super important existence referendum. Fun week! 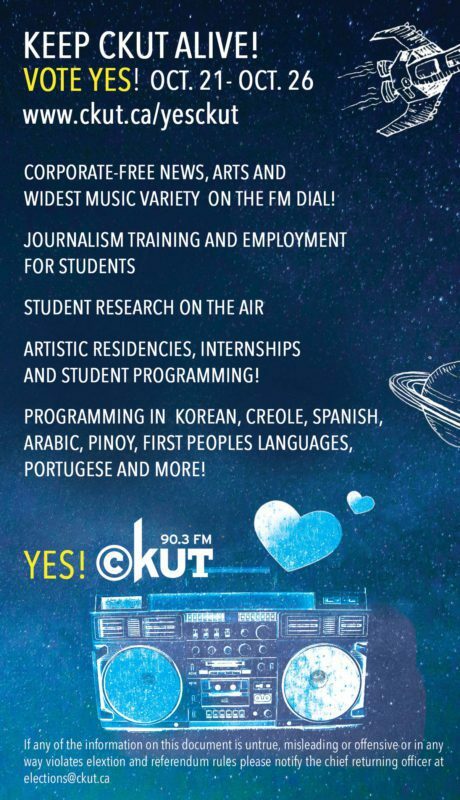 If you are a McGill student, please be sure to vote YES to keep CKUT alive – polling ends Wednesday at 5pm and we still need to reach quorum, so the time is now. 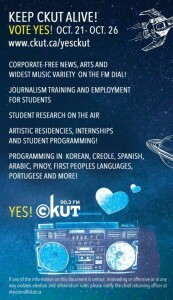 For those of you who aren’t McGill students but still <3 CKUT, consider supporting us through our funding drive! We have tons of amazing prizes to make it extra worthwhile for you. Come say hi at one of our events or donate online here. Never forget – CKUT loves you! This entry was posted in Charts and tagged existence referendum, funding drive, top 30, total eclipse of the charts on October 25, 2016 by CKUT Music Coordinator.